The Borodin Quartet’s relationship with Shostakovich’s chamber music is intensely personal. This special association between creator and interpreters originated in cellist Valentin Berlinsky’s student days, when he studied the First Quartet with the composer. Thereafter, the Borodin Quartet would play through each new quartet for the composer before its premiere. As well as giving Shostakovich the chance to hear his music before it was made public, these sessions enabled the players to receive the composer’s advice on the nuances of performance. There is ample evidence that Shostakovich regarded the Borodin ensemble as unsurpassed advocates of his music. Not only did he regularly perform his Piano Quintet with the Borodin members, he also entrusted them with private performances of his Fourth Quartet in 1949, in order that it could be vetted by the Soviet Ministry of Culture before being made public. Coming just months after the composer’s denunciation by the authorities, this was an occasion demanding the utmost poise and discipline. The first firmly established Borodin formation – Dubinsky, Alexandrov, Shebalin and Berlinsky – therefore had extensive experience of playing for and with the composer. Not only was Berlinsky a close friend of the composer, but viola-player Dmitri Shebalin was the son of composer Vissarion Shebalin, very much part of Shostakovich’s inner circle. Igor Naidin, who joined as viola player after Dmitri Shebalin retired in 1996, says: “Shostakovich watched over the Borodin Quartet’s development through its first generations. You could say he gave his blessing to the quartet’s playing of his music. Of course, the members who played his quartets to him before they were heard in public remembered all his remarks about interpretation, and the way of playing that met with his approval. Mr Berlinsky was the guardian of this tradition – we have received the ‘information’ from him, and as the next generation we will look after it. Even though cellist Valentin Berlinsky retired from playing in 2007, he remains the quartet’s artistic advisor. He has always maintained that each new generation of the Borodin Quartet has brought its own refinements to the search for an ideal Shostakovich interpretation – while expressing admiration for Rostislav Dubinsky’s inspirational playing as the original first violin, he equally acknowledged the more conscious fidelity to the score of Mikhail Kopelman. 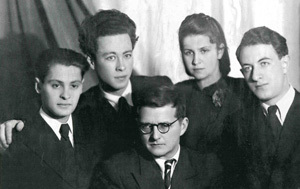 Both of the ensemble’s current violinists met Shostakovich in later years, and their playing respects and reflects the quartet’s decades of knowledge.